For the archetype, see Hand (archetype). 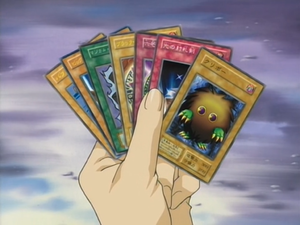 A hand of cards in the second series anime. A player's hand (Japanese: 手（て）札（ふだ） Tefuda) refers to the cards each player holds that have not yet been played. Cards that are drawn are placed in the hand, although cards can be added to the hand in other ways. As the name suggests, such cards are generally held in a player's physical hand. From your hand, among other things: Monster Cards can be Normal Summoned/Set, Pendulum Monsters can be activated in the Pendulum Zone, Spell Cards can be activated, Spell/Trap Cards (except Field Spell Cards) can be Set in the Spell & Trap Zone, and Field Spell Cards can be Set in the Field Zone. During your End Phase, you must discard cards until you meet the hand size limit (normally six, but it can be changed by card effects). Certain card effects can interact with cards in players' hands. For example, "Spirit Reaper" can discard 1 card from the opponent's hand as part of its effect, and "Exchange" allows you to swap one card from your hand with one card in your opponent's hand. Many card effects have costs that require discarding a card(s) from your hand, such as "Raigeki Break", and you cannot activate such effects unless you have enough cards in your hand to pay the cost. This page was last edited on 12 December 2015, at 16:23.